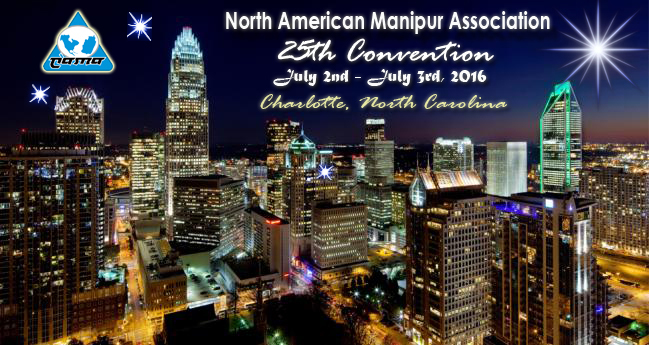 The North American Manipur Association (NAMA) will be celebrating its 25th annual convention on July 2nd and 3rd, 2016 at Charlotte, North Carolina. For this grand Silver Jubilee celebration, we would like to invite everyone who is interested to attend this event. If you are going to be traveling to the USA or if you are going to be in the USA at this time, please do not fail to attend the convention. The NAMA members are working diligently to bring you a weekend full of surprises and fun activities. Come, let us all celebrate, flaunt our traditional attire and show the world how proud we are to be born as Manipuris. We request your kind presence to make this event complete. For more details and for any queries, please contact NAMA at namagroups(aT)gmail(doT)com . We will be adding more information about the event as the time gets closer.